Reception: Saturday, June 15, 4-6 p.m.
Place and Displace, located in the Main Gallery, presents paintings and multimedia works by artist Carlos Beltran. 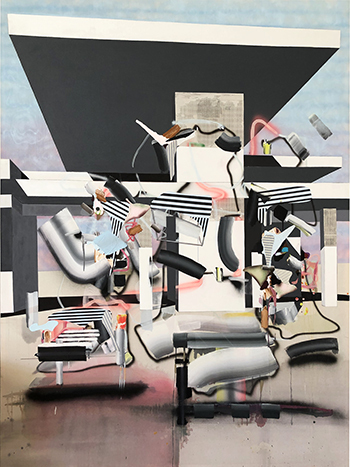 Through Beltran’s approach to painting as a kind of speculative call-and-response, his works complicate and explore ideas of place, time, and geographic boundaries. His paintings reference architecture, landscapes, natural and constructed environments, and histories of migration through gestures that are informed by embodied knowledge, improvisation, and material investigation. Beltran’s artworks suggest that the worlds we inhabit — both real and imagined — exist in perpetual states of formation, collapse, and reconfiguration. Time Under Tension, located in Gallery 1, presents works by Eduardo Aispuro and Patricia Liverman, who treat the surface and substratum of their art in such a way that they draw attention to what is invisible as much as to what is visible. Aispuro employs the language of minimalism in his paintings as a point of departure to investigate ideas of construction, the body, and phenomenology. 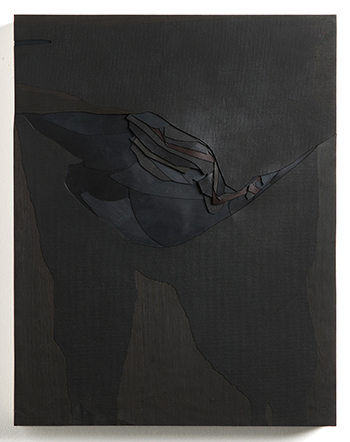 Liverman’s paintings, made up of accumulated fragments of oil paints, call to mind topographic maps formed by series of dramatic eversions. Together, Aispuro and Liverman’s paintings prompt viewers to consider rupture, concealment, and transformation as actions that shape the world. Admission and parking are free. The Irvine Fine Arts Center is located inside Heritage Community Park at 14321 Yale Ave. For more information on our exhibitions, call 949-724-6880.